Years of Democratic rule will do that to a city. 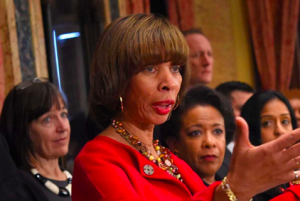 In a segment that aired on Fox 45 earlier this week, the mayor and other city officials tour some areas impacted by Pugh’s 2017 violence-reduction initiative, the Baltimore Sun reports. While walking through an area filled with decrepit, vacant homes, the scene overwhelms Pugh.